Leading manufacturers, importers, distributors and purchasers will be coming together on 13 May-4 June in the biggest edition of the BIEMH Machine-Tool Biennial in recent years. The biggest industrial trade show in Spain is back in full strength this year, with 1533 exhibitors from around 30 countries, 2605 products, 1163 large-scale machines in operation and an economic impact estimated at €36 million. The latest technological innovations will become business opportunities at the BIEMH thanks to the presence of thousands of trade visitors from leading markets. The event is set to help in the recovery of industry by providing the keys to developing new products for investment and modernisation of production machinery. Moreover, to strengthen its commitment to advanced manufacturing ADDIT3D, the first trade fair on 3-D and additive manufacturing, is to be staged concurrently with the BIEMH. At the same time, on 31 May-3 June the first edition of WORKInn will provide specific job and training offers for students in areas associated with industry and for trade specialists actively seeking employment. That same week, the Bilbao Exhibition Centre will also be offering other events in the shape of the Oil & Gas Conference on 31 May-1 June and the Maintenance Innovation Conference on 2-3 June, making the centre of a major focus of attraction for industry. 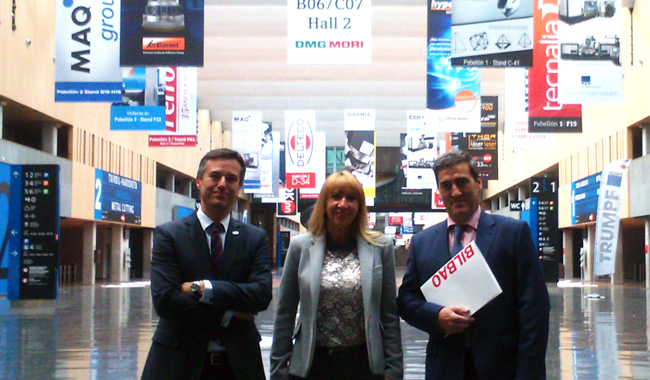 The BIEMH is organised by the Bilbao Exhibition Centre and AFM-Advanced Manufacturing Technologies, in cooperation with the Basque government and AIMHE (the Association of Machine-Tool Importers). Centre stage at the 29th BIEMH will be taken by “smart solutions”, and new ways of tackling the challenges of Industry 4.0 will be presented. Foremost among them will be concerts concerned with applying the “Internet of things”, collaborative robotics, virtual and augmented reality, automation, control and monitoring of complex processes. It is to be a “manufacturing fair for manufacturers” where the present and future come together to provide tailor-made solutions in hyper connected, flexible, smart systems. The exhibition area will occupy all the available space at the Bilbao Exhibition Centre, and will be taken up by firms working with cutting machinery (22%), forming and plate cutting machinery (12%), tools (12%), accessories (10%), hydraulic and pneumatic components (9%), robotics and automation (9%), metrology and quality control (5%), software for production and manufacturing (4%), electrical and electronic equipment (4%), welding (3%), services (5%) and other machinery (5%). Hall 1 is to host cutting machinery, metrology, CAD/CAM and software firms, while Hall 2 is home to cutting machinery, Hall 3 houses ADDIT3D, cutting machinery, robotics and welding, Hall 4B hosts accessories, components and ICTs, Hall 5 plate shaping machinery and Hall 6 accessories, components and tools. Firms from 27 countries will be showing off their equipment, products and services at the BIEMH, seizing the opportunity provided by the current upturn in domestic demand. As a result the event has become more strongly international: 59% of exhibiting firms at the 29th biennial are from outside Spain, particularly from Italy, France, Germany, Portugal and Taiwan, though there are will also be companies and brands from the Czech Republic, Switzerland, China, Turkey, Bulgaria, Belgium, the Netherlands, Austria, Denmark, Argentina, the USA and Sweden among many other countries. These firms will use the BIEMH to showcase their leading products specialists in the Spanish market but also in other markets elsewhere in Europe and in South America. The possibility of accessing broader international circuits thanks to the international buyers’ programme set up by the Bilbao Exhibition Centre is another feature rated highly by exhibitors at the BIEMH. Exhibitors will be showing off their latest technology at the BIEMH, featuring live, accessible demonstrations of innovative solutions aimed at helping firms to continue becoming more competitive. With 2605 products, including 1163 working machines, the event will once again be an all-round showcase for new products and tendencies in advanced manufacturing from leading brands. It is precisely the participation of highly innovative firms with high value-added products that has made the BIEMH one of Europe’s biggest events of its kind, as reflected in its claim and logo “You make it big”. The highlights as regards large machines and new products this year include the TruBend 7036 by TRUMPF, a press-brake which stands out for its perfect man/machine interface, its high feed speed and its optimal working conditions conducive to overall productivity increases. Also featured will be the Thor World Premiere by TECOI, a new concept in high-power machining designed for drilling to stringent quality specifications, with high capacity for medium and large-sized workpieces; the new LG-1000 grinder by DANOBAT, which is the biggest model in its range and is designed to produce highly complex parts such as cutting tools, precision hydraulic components and automotive parts; the new Geminis GT7/R lathe by GORATU for machining shafts and mounted wheels as the latest innovation in the Geminis range of horizontal lathes for the railway industry; the Laser FO 3015 M2 by AMADA, the 3rd generation of the firm’s laser FO range of powerful, versatile machinery capable of processing a wide rnage of different materials with the maximum precision and efficiency; the SPRINT 32|8 automatic lathe by DMG Mori, characterised by the convenient, functional design of its workstation, its motorised tools and its Y-axis unit on the main spindle, which can be used for a wide range of applications including the turning of rods up to 25 mm in diameter for the automotive, hydraulic and electronic industries and the medical sector; the THC 12 Multiprocess by IBARMIA, a milling and turning centre that shapes the future in continuous development; and the a specialist lathe for machining and threading piping for oil exploration and drilling by GURUTZPE. The directory of exhibitors at the BIEMH will remain operational until 2018, providing interactive information on the leading firms in the sector, with technical descriptions of their products, details of innovations, news stories, pictures, multimedia presentations and ads seeking agents and distributors. The machine-tool industry plays a key role in important sectors of the economy, so the thousands of trade specialists from the automotive, capital goods, iron and steel, aeronautics, energy, railway and shipping industries, among others, will be travelling to the Bilbao Exhibition Centre from far and wide. Many have already registered to attend the event, while others will do so directly at the venue as from May 30. The hosted buyers’ programme has a special role to play in the context of foreign visitors. Under this programme the BIEMH organises visits from groups of management staff, owners and purchasing managers from firms selected mainly by the exhibitors at the event on the basis of their interest in purchasing machinery and products. For this years event 310 such specialists have confirmed their attendance, from 28 countries including Germany, China, Colombia, the USA, France, India, Japan, Italy, Mexico, Portugal, Turkey, Algeria, Morocco and Tunisia to name but a few. This programme is arranged and coordinated by SPRI (the Association for the Promotion and Restructuring of Industry), an organisation answerable to the Basque Government, and agents of the Bilbao Exhibition Centre itself, working in co-operation with Spanish chambers of commerce abroad. This year the event organisers have further reinforced actions to encourage visits from strategic domestic purchasers, also in line with indications from exhibiting firms. As a result, high-level staff from firms such as Aerotecnic Metallic, Indaisa, Inoxforma, Tecfluid and Ziacom Medical, among others, will be taking part in the event as special guests. The BIEMH is set to be a highly dynamic event with distinctive areas for interacting and learning about the main products, innovations and market trends in different ways. It features an attractive programme of activities, 1 of the high points of which is set to be the ceremony on 1 June for the awarding of the 12 National Innovation Award, organised by AFM in co-operation with the BEC and BEAZ. The awards are handed out will be for innovation in machine-tools, components, accessories and tools. There will also be awards for additive manufacturing and the integration of 4.0 concepts. These last two categories are a new and have been created reflect how strongly the relevant areas have emerged in industrial production. The firms shortlisted for awards this year are Danobatgroup, Ibarmia, Industrial Augmented Reality, Madaula, Metrología Sariki, Mizar Additive Manufacturing, Nicolás Correa, Soluciones Sicnova, Trimek, Veedor Solutions and Zayer. ADDIT3D is to be the first trade fair covering 3-D and additive manufacturing in Spain. It is to be held concurrently with the BIEMH. With this event the organisers — the Bilbao Exhibition Centre and Addimat — are taking a further step in their commitment to advanced manufacturing, by offering a point of reference for technologies which are revolutionising industrial activity. ADDIT3D is a pioneering initiative that is set to lead the field in events in its sector. A total of 84 firms working with machinery, industrial applications, materials and research will take part in the exhibition area of ADDIT3D, and the event will also feature a wide ranging programme of talks and activities combining information and technical aspects with the presentation of products and innovative applications. Thematic blocks such as “The paradigm change in component manufacturing”, “3-D printing and its applications in strategic sectors” and “3-D printing comes to the aeronautics industry” will enable visitors to take a close look at additive manufacturing from different viewpoints and learn the full extent of the many advantages that it offers. The move to set up a specific forum devoted to these technologies has been made in response to concerns expressed by businesses wishing to go further in their development of manufacturing 4.0 and reinforce their competitive edge. Companies which are just beginning to introduce additive manufacturing into their processes and those which have already applied it to a large extent will all find new cancers and solutions covering the whole value chain. The official opening of the BIEMH, chaired by Basque Premier Iñigo Urkullu, will take place at 11 a.m. on Monday 30 May. Opening hours: Monday-Friday, 9:30 a.m. — 6 p.m. and Saturday 9:30 a.m. — 3 p.m.